The "Next Generation" . 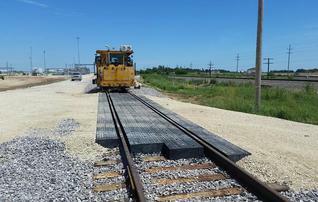 . .
ENDURANCE®-XL is considered LT Resources’ second generation of highway-rail grade crossings. ENDURANCE®-XL, “The Next Generation of Highway-Rail Grade Crossings”, was introduced in 2008 with the same basic design as the original ENDURANCE® product, but with an improved formulation, making the product approximately seven to eight times stronger than the original ENDURANCE® product. ENDURANCE®-XL utilizes a proprietary recycled materials formulation and a patented manufacturing technology, resulting in superior performance and extended service life in severe environments. ENDURANCE®-XL was considered LT Resources’ first premium crossing surface product by State DOT’s and Class 1 railroads alike. ENDURANCE®-XL has been readily substituted for concrete and rubber to provide superior performance. Over 55,000 track feet of ENDURANCE®-XL Highway-Rail Grade Crossings produced between 2008 and 2013 have been installed throughout the U.S., Canada and Mexico and continue to perform well. ENDURANCE®-XL is now produced for use with 90#, 115# and 136# rail with an improved skid resistant design. ENDURANCE®-XL can be used with or without rubber panel inserts. 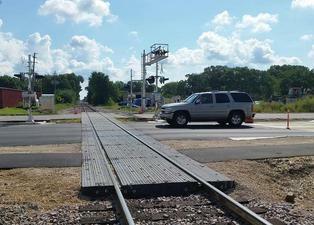 Please contact LT Resources for further information regarding ENDURANCE®-XL Highway-Rail Grade Crossings. To purchase any of our products, please call or e-mail LT Resources.